That’s a question that gets asked a lot, I feel like, when a team makes an improbable run to playoff glory or something along those lines. And yes before you even say anything, this is 100 percent getting way too ahead of ourselves. 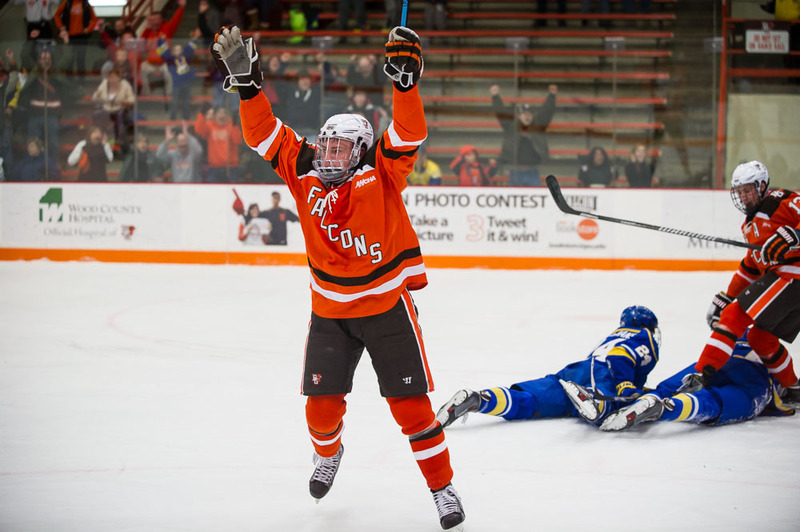 But if you’re hypothetically looking at the end of the season, and BG is winning the WCHA Final Five or making the NCAA Tournament or who knows what else, and someone (likely me) asks Chris Bergeron that question, I’d bet that he points to Saturday night’s tie against Alaska. Let’s be real. You put a BG team from two years ago into that game, they lose it 7-1. I’d even gander that there was a point last year that if you put that team in Saturday’s situation, they would’ve had a hard time stopping the bleeding. But not this team. This team is something else. It’s like they’ve been so hardened by experiencing just about every situation you could imagine the last year or two or three, that this stuff doesn’t phase them anymore. I mean, you couldn’t even script that game. Getting 17 shots in the first period, yet still trailing 2-1 on a pair of soft goals? Then the sheer puck luck Alaska received on the fourth goal? That’s the defining characteristic of this team. They aren’t flashy and they aren’t going to blow you out of the building with skill. But what you have is a hard-working group that has bought into the system. Us media type have heard it a lot the last five years, but Bergeron always talks about trusting “the process.” Well this looks like a team that trusts it, and has the experience and the talent to turn that into the product we’ve seen the last three months. That was a pretty good team the Falcons just took three of four points from, and did it by a combined 6-0 score in the third period. That’s a huge reversal from last year. You’re looking at a team that’s lost once since Halloween. As of this writing the newest polls haven’t been released, but by the time you read this, Bowling Green is probably going to be a top-10 team in the nation. The Falcons didn’t luck into that. Yeah, this team isn’t perfect and there’s stuff they’ll have to improve on to continue this little climb. But those are things we’ll tackle here another day. But you don’t always realize you’re witnessing something special until after the fact. And maybe that nine-game unbeaten streak ends in Houghton this weekend, maybe it doesn’t. But for a moment, let’s stop and take a breath. There’s still work to be done, but as long as they keep that mentality, things are gonna keep getting fun.